I have a new love… in the kitchen! I am fairly confident of my abilities in preparing a lover, significant other or even an early bird friend a more than decent breakfast. Despite that, in the year and a half that I’ve been living with Tom we have not been able to get a decent egg out of our kitchen. At least, not until this morning! One thing changed this morning and it may change the way breakfast is prepared in our home forever! We did not change the eggs we bought, we did not change butter or oil or recipe. What I changed was the pan! We were reminded this morning that in the kitchen, your tools are just as important as your ingredients. 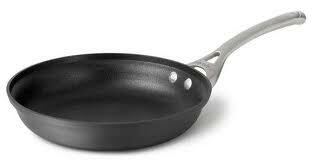 Feast your eyes on our lovely 10-inch Calphalon Contemporary Non-Stick Pan. Breakfast this morning was the easiest it has ever been. So much so, I’d like to invite six people over and cook them eggs too! I turned on the stove, cracked a couple of eggs and slid those puppies right off the pan! I think I was there all of five minutes! Seriously, you know it has to be an amazing piece of cookware if I dedicated a couple paragraphs to it. If you’re into kitchen gadgets and such it is not a pricey buy. I say, if you like eggs and are tired of scraping overcooked breakfast off a pan – GET ONE! Yes! Yes! A good pan can change your life. Just like a good knife. Definitely deserves a couple paragraphs.